D olphins and whales are threatened globally by pollution, habitat degradation, overfishing and ocean noise, and unsustainable whale watching tourism. Many thousands are killed annually as bycatch in nets and through direct hunts. For a few years it has been known that growing shipping traffic is adding another serious threat. Besides the ever increasing noise levels in the oceans produced by maritime traffic, ships can also physically hit whales and dolphins. 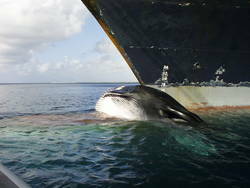 It is well known that the number of such ship-whale collisions (“ship strikes”) is rising worldwide. Today several whale populations are threatened by extinction due to the high numbers of animals being killed by ship strikes. But collisions pose a serious risk to both cetaceans and humans. Here we want to highlight this problem in more detail. How do collisions occur? Which types of ships and which cetacean species are involved? How can ship strikes be avoided? These questions shall be answered, as far as scientific evidence and current knowledge allows it. A separate look will be taken at the Canary Islands, where the problem is prevalent due to the large number of high speed ferries travelling throughout the archipelago. Finally we will draw attention to our own investigations and MEER`s involvement on an international level. We want to give an overview of the issue, highlight possible solutions and present recommended procedures to decision-makers. Finally, you can find information on the sources used to produce this text, which will enable you to further investigate the topic. The establishment of this section was supported by Deutschen Umwelthilfe.